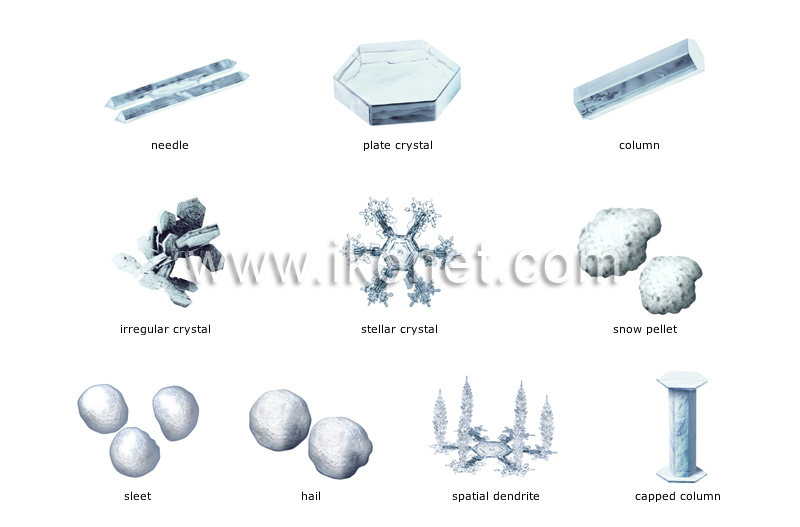 Ice crystals whose form depends on temperature and humidity; they fall separately or in agglomerations of flakes. Short translucent ice crystal with flat extremities; it is prism-shaped and occasionally hollow. Ice crystal in the form of a thin hexagonal plate that is occasionally hollow. Ice crystal characterized by complex branches similar to those of a tree. Ice crystal with no defined shape resulting from the agglomeration of several crystals. Star-shaped crystal with six branches. Opaque ice crystal less than 5 mm in diameter that froze inside a cloud. Ice crystal less than 5 mm in diameter that results from rain drops or snow flakes freezing before they touch the ground. Hard, usually spherical ice crystal that varies between 5 and 50 mm in diameter; it is formed of concentric layers of clear opaque ice. Ice crystal that is identical to the column, except for the thin hexagon-shaped cap at each extremity. Translucent prism-shaped ice crystal; it is long and narrow and has pointed ends.